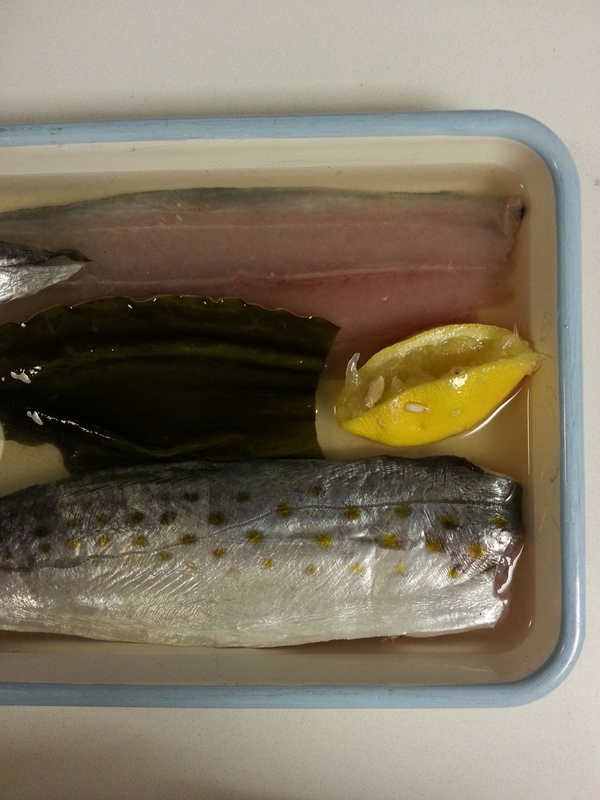 Mackerel (Saba or “King Mackerel”) is a kind of fish that is more commonly pickled than served raw in Japanese cuisine. This is true of a lot of “hikarimono” or blue fish, like sanma (Pike Mackerel). The fish for sushi traditionally was cured and pickled, and this preparation method still exists even though fresh fish is readily available. Anything cured is called “shime …”. 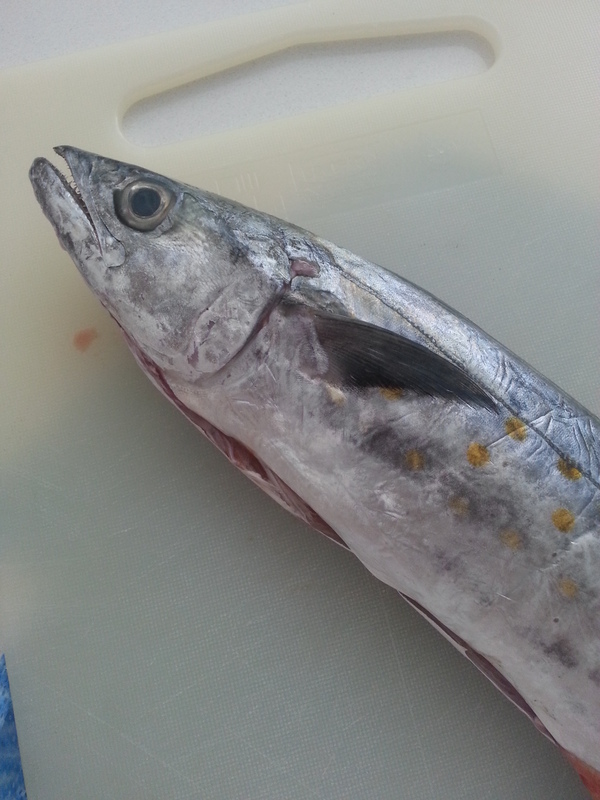 I went to Greenpoint Fish & Lobster to get my fish but they didn’t have any King Mackerels, so I settled for a Spanish Mackerel from Florida. I was a little reluctant because Spanish Mackerel is a “Sawara” and in Japan, Sawara are typically used in cooked applications rather than raw or cured. I got a whole fish and fabricated it myself but you can get fillets as well. To pickle this mackerel I used a recipe from Junichi Ito’s cookbook 和の技法が生きるエルルカンのフレンチ, which is a great book that shows how traditional Japanese cooking techniques are applied in this chef’s French cooking. He used to own two restaurants, L’Herlequin (now closed it seems?) and L’Herlequin Bis. I’ve been to the one in Yugawara twice, and I loved his food. The cookbook is actually written in both Japanese and English so I highly recommend it. After filleting the fish,place them skin side down and sprinkle a thin layer of the salt seasoning. Leave it for one hour. Then sprinkle another thin layer over the fillets and leave for another hour. The point of this step is to remove excess moisture from the fish. Remove all the water that is released and pile on a thick layer of the salt seasoning over the fillets and leave for four hours. Clean the fish under cold running water and wipe with a paper towel. Pickle in the vinegar mixture for 40-60 minutes. Konbu was not in his recipe but I pickled the fish with a small piece of konbu. 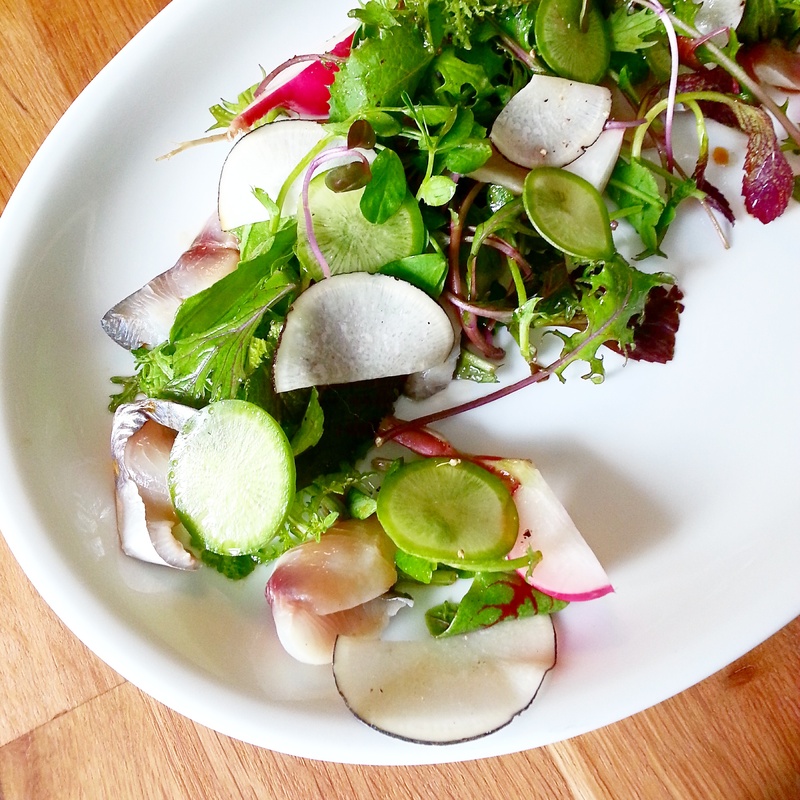 Serve the pickled mackerel with some salad greens and radishes. I got my green from Lani’s Farm at the Union Square Greenmarket, and organic radishes from Norwich Meadows. Dress the salad greens with a simple vinaigrette (I used brown rice vinegar and olive oil).